Children must be under 4’ 10” (148 cm) and under 12 years old to enter the play area. 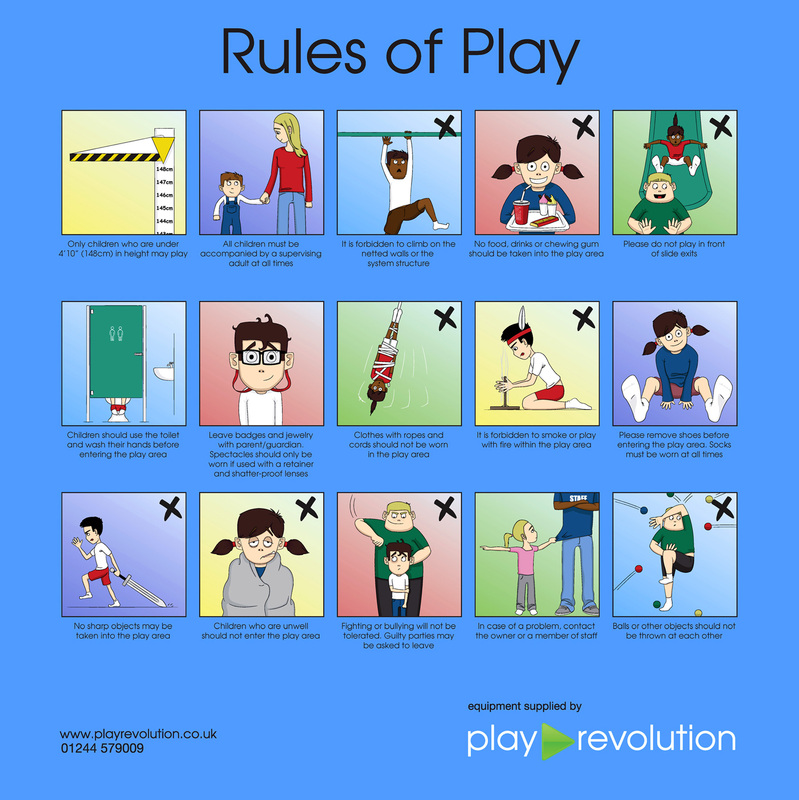 Children & adults must adhere to the rules of play advertised in the facility. Children must be supervised by an adult or guardian at all times. Staff only supervise the correct use of the equipment and cannot take responsibility for children. Children/young adults between the age of twelve and seventeen are not permitted on the equipment. Supervision or assistance of younger children must be done by an adult of 18 years of age or over. Adults are not allowed to play on any of the equipment. Children using the baby area must be accompanied by an adult at all times. For hygiene and safety reasons socks must be worn at all times, by both children & adults. Long sleeves and trousers are required for safe play, we recommend that short skirts and dresses are not worn, no shoes are allowed in the play system. Remove all sharp or hard items such as watches, and belt buckles before play. Only food and drink purchased at play can be consumed on the premises. When using the slide please keep your arms folded at all times. It is recommended that arms and legs are covered when using the slide, no trains – make sure the person in front has reached the bottom before you set off, always sit down, face forward & never climb up the slide. For Health and Safety reasons children are not permitted to run anywhere on the equipment, around the cafe bar, tables and chairs and in the toilets. If extra sweets/gifts are provided by the parent/guardian for placement in the party bags/boxes provided by play! they must be of a size and quantity that can reasonably be expected to fit. Food may contain nuts or traces of nuts. You must bring your birthday cake, candles and serviettes to wrap the cake with you on the day of your party. We cannot be held responsible for any food or drink products not purchased from, or supplied by play! We cannot be held responsible for the loss, damage or theft of any personal property during your time at play!